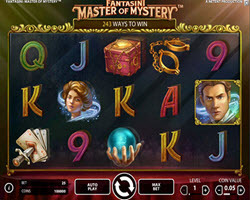 NetEnt, one of the leading software developers in the online gambling market has announced this week the arrival of their latest upcoming video slot called “Fantasini: Master of Mystery”, this game is slated to be released on January 21st, 2016 and will surely be an astonishing game to start off the year. This slot is developed with 5 reels with 243 ways to win, it’s a video slot that is based all around the art of magic and due to this makes the game feel mystical. The icons on the reels consist of a magician, sorceress, magic box, handcuffs, magic cards and themed poker suit symbols will make an appearance. There is also a jackpot available to be won worth $270,000. Unfortunately, there is no word as to what game features will be released with this game. Those whom wish to gain a more detailed perspective on this title only need to go to the NetEnt YouTube Channel, they’ve released a preview video of this title for all to see. In this video it reveals that as of right now this game is only available on their desktop platform. If this game reaches a certain level of popularity though, it’ll be ported over to mobile devices as well. Whomever wishes to experience this game on January 21st only needs to find an online casino which best supports their needs as a player and also offers the NetEnt platform. After signing up dozens to hundreds of casino games will be at player’s fingertips.